The median eminence is a specialised region at the base of the brain containing the hypothalamo-hypophysial portal vessels and neuroendocrine nerve endings that release their products into them. 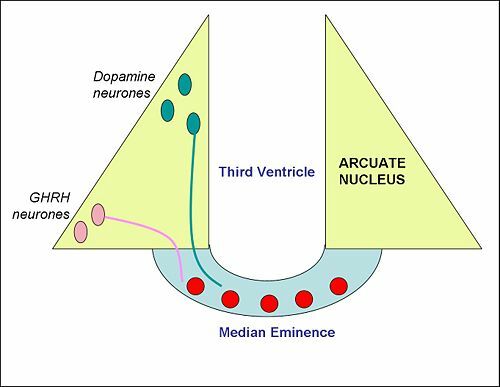 The median eminence is a midline structure, immediately below the third cerebral ventricle, bounded laterally by the arcuate nucleus, posterior to the optic chiasm and rostral to the neural stalk that connects the posterior pituitary gland to the hypothalamus. Schematic view of the ventral surface of the brain below the hypothalamus. The median eminence is between the pituitary gland and the optic chiasm, and contains the blood vessels of the hypothalamo-portal system. The median eminence has two zones, an internal zone and an external zone. The internal zone contains the axons of magnocellular neurosecretory neurons of the supraoptic nucleus and paraventricular nucleus that project to the posterior pituitary. The external zone contains the convoluted blood vessels of the hypothalamo-pituitary portal system, and the nerve endings of many neuroendocrine neurones. These portal vessels transport releasing factors released by neuroendocrine neurones of the hypothalamus to the anterior pituitary gland. thyrotropic stimulating hormone (TRH) neurones that regulate thyroid stimulating hormone (TSH) secretion. Schematic cross section of the mediobasal hypothalamus, with the median eminence at the bottom. The blood vessels in the external zone of the median eminence are fenestrated, so this zone is outside the blood brain barrier, making it one of the brain's circumventricular organs. This property means that peptides released from neuroendocrine neurones can freely enter blood vessels. Damage to the median eminence can result in impairment of hormone secretion from the anterior pituitary gland, and in polydipsia (excessive thirst) and polyuria (excessive production of urine) - symptoms of diabetes insipidus as a result of an impairment of vasopressin secretion. This page was last modified 16:12, 2 May 2009.